For a first-time mother, one anxiety-inducing conundrum is when to introduce solid foods, and which ones to start with. Fortunately there is a wealth of good information available from government agencies such as the Food and Drug Administration, as well as many medical schools, university extension services and women's advocacy organizations. There's a broad consensus that legumes such as split peas are a good choice for your baby, because they're low in fat and high in protein. Protein is essential for healthy living at any stage of life, but it's especially crucial for infants during their first year of life. Protein is the fundamental building block of most human tissues, and infants build a lot of new tissue. Protein is necessary to the growth and proper function of the brain, as well as internal organs, skin, eyes and muscles. Breast milk or properly formulated breast milk replacements will provide all of an infant's protein requirements for the first several months, but between 6 and 8 months of age most children begin to need more. During that 6-to-8-month interval, when you begin to introduce solid foods, legumes will likely be among the first few vegetables. They are among the best vegetable sources of protein, though they need to be supplemented with grain products to supply all the necessary amino acids. They're also low in fat, and most are high in iron and other important minerals. They also puree easily to a smooth consistency, an important consideration with very young children. Peas and lentils are the best choices, since beans are higher in gas-causing sugars that can make for a fussy and colicy baby. 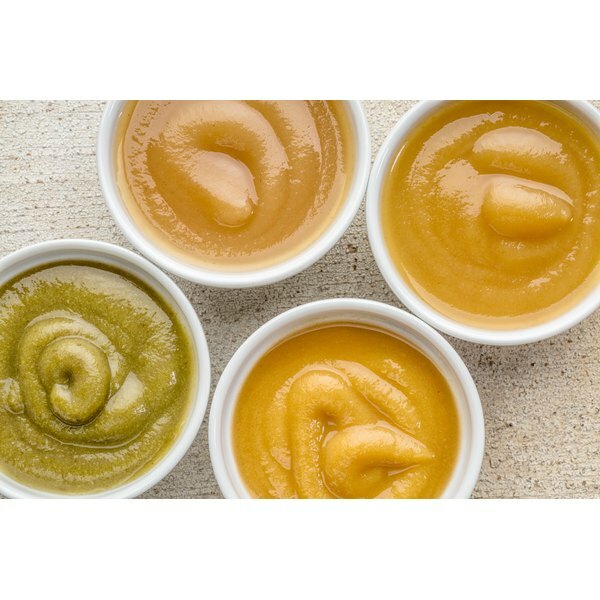 There are two kinds of peas commonly pureed for use as baby food. These are fresh sweet peas and dried split peas. Although both are peas, there are slight differences between them. Fresh sweet peas are higher in sugars and lower in starches, which makes them more digestible. They can be introduced at around the 6-month mark, according to the University of Maine's extension service. Dried split peas are higher in starch, and the university suggests that those be introduced at approximately 8 months. Peas aren't the only legume that can be pureed and used for infant nutrition. Lentils are another good choice for young eaters and their parents. They cook quickly, especially the red variety, and don't require any preliminary soaking. Red lentils will cook to a smooth pureed texture all on their own, but with other varieties you'll need to force them through a sieve to remove the tough skins. Lentils can be introduced at around eight months, like dried peas. Less-digestible beans should be introduced at 12 months.